Welcome to Music Friday when we bring you new tunes with jewelry, gemstones or precious metals in the title or lyrics. Today, Parade of Lights' lead vocalist Ryan Daly urges us to get "golden" in the 2014 release of the same name. 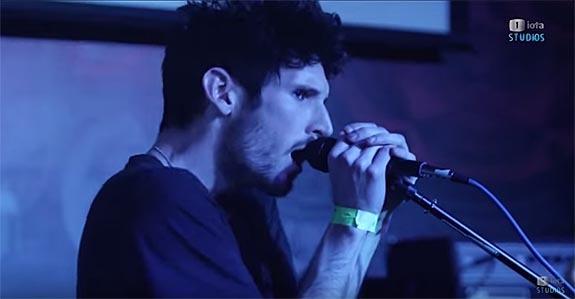 The Los Angeles-based electronic rock band uses the word "golden" as a metaphor for youthful spirit in a dance anthem that manages to harness the group's frenetic energy and deliver a message of hope. In the powerful hook, Daly sings, "Everybody get golden / Everybody get golden / And put your hands up to the sky / Everybody get golden / Just for tonight / Everybody get golden / So we can go until we shine." "Golden" was originally released as the title track of the band's 2014 EP. 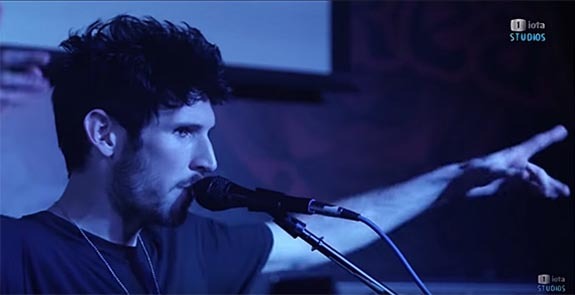 It then reappeared as the fourth track on the band's 2015 LP titled Feeling Electric. The EP charted at #44 on the Billboard US Top Heatseekers Albums list, and the LP ascended to #24 on the Billboard US Dance Electronic Albums list. Formed in 2010, Parade of Lights features the talents of Ryan Daly (lead vocals/guitarist), Anthony Improgo (drummer), Randy Schulte (bassist) and Michelle Ashley (keyboardist). The group was signed by Astralwerks in 2014 and released its first LP a year later. The Parade of Lights official website defines the group's mission: "Making music is a matter of turning their shared obsessions with distortion-drenched shoegaze, heady synth-pop and epic stadium rock into a hook-heavy, yet deeply inventive, alt-electro hybrid." Written and performed by Parade of Lights. 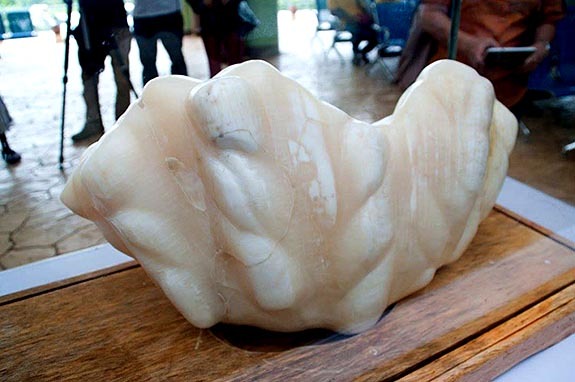 Unaware of its multi-million-dollar value, a Filipino fisherman kept a 75-pound natural pearl under his bed as a good luck charm — for 10 years. Every time he would head out to sea, he would touch the pearl to ensure his safety and good fortune. The fisherman had found the pearl by chance when his boat's anchor got caught up on a giant clam. 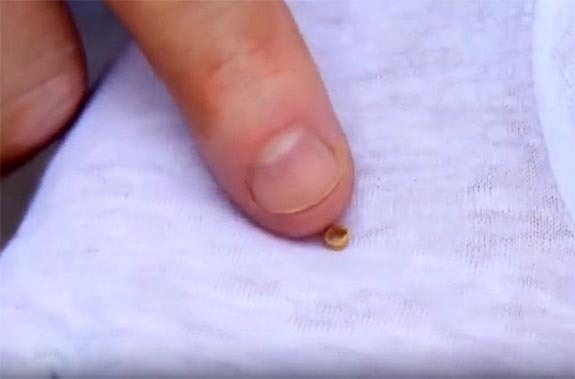 When the fisherman dove down to the ocean floor to release the snag, he discovered in the clam what many experts believe is the world's largest natural pearl. Measuring 12 inches wide and 26 inches long, the scallop-shaped pearl looks like it grew to fill the void inside of the shell. 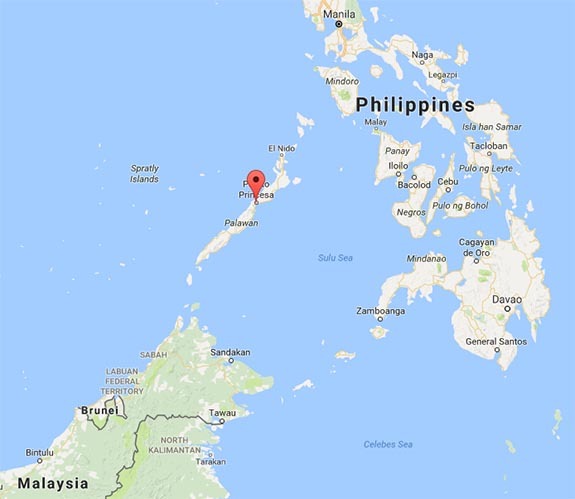 If found to be authentic, the pearl — discovered near Puerto Princesa City, about 500 miles southwest of the capital city of Manila — could be worth in excess of $100 million. The fisherman had been completely unaware of his potential windfall. The fisherman recently entrusted the amazing pearl to Aileen Cynthia Maggay-Amurao, a relative who works for the Puerto Princesa tourism office. He asked her to take custody of the unwieldy good luck charm because he was about to move outside the province and couldn't take it with him. Recognizing the pearl's potential star power, she asked the fisherman if he would approve of the pearl going on display as the city's newest tourist attraction. He agreed, and now the "Pearl of Puerto" is housed in the Atrium of the New Green City Hall. Maggay-Amurao is encouraging gemologists to visit the city to study the pearl and make a determination of its authenticity. On Facebook, Maggay-Amurao posted a few photos of the giant pearl balanced on a large scale. 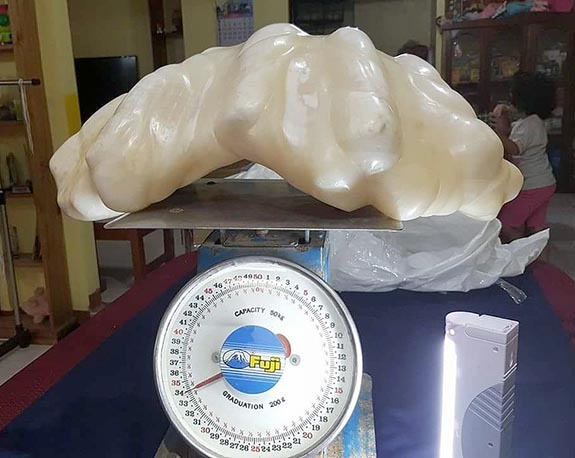 Her caption read, “The Puerto Princesa City would likely earn another prestigious title and a record breaker for having the world’s biggest natural giant pearl from a giant clam (34 kilograms) after being certified for its authenticity. Need help from gemologists!" A natural pearl forms when an irritant, such as a grain of sand, slips in between the mollusk’s shell and its mantle tissue. To protect itself from the irritant, the mollusk secretes layer upon layer of nacre, which is an iridescent calcium carbonate material that eventually coats the invader and produces a pearl. Giant clams can live for over 100 years and grow to be about four feet wide and weigh more than 500 pounds. The $100 million valuation is based on another giant pearl that was found in the same area back in 1939. 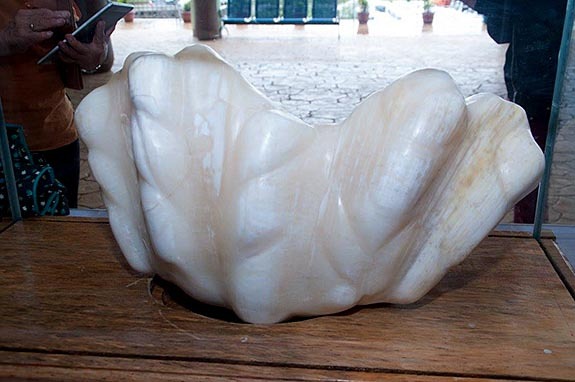 Called the Pearl of Lao Tzu, the previous record-holder weighed 14.1 pounds and was valued at $93 million by a Colorado gemologist in 2003. The Pearl of Puerto weighs more than five times as much as the Pearl of Lao Tzu and, for the record, a 75-pound pearl is equivalent to 170,000 carats. Although the fisherman has allowed the city to display his extraordinary find, he retains his ownership status. Only time will tell what kind of payday the sale of the pearl may yield. Credits: Images via Facebook.com/City.Government.of.Puerto.Princesa; Facebook/Aileen Cynthia Maggay-Amurao; GoogleMaps.com. 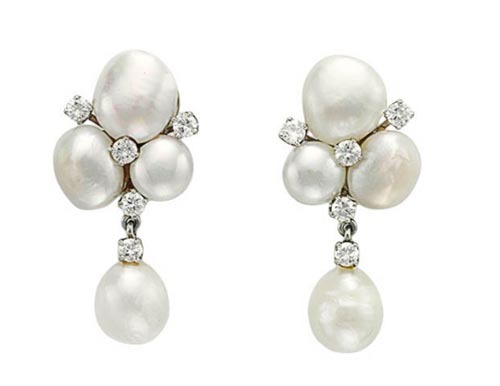 Eighty-three pieces of fine jewelry worn by fashionable First Lady Nancy Reagan are set to hit the auction block at Christie's New York in September. A live auction will take place on September 21 and 22, and an online auction will run from September 19-28. 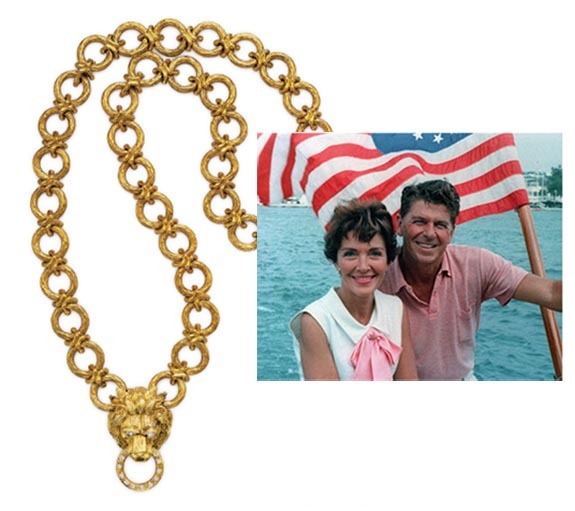 Among the items from The Private Collection of President and Mrs. Ronald Reagan are necklaces, earrings, bracelets, pendants and brooches with an estimated value of $280,000. Experts believe the jewelry could easily surpass the auction house's high estimates because the pre-sale prices reflect their current market value, while the provenance of the items was largely left off the table. The most expensive piece in the First Lady's collection is a diamond-and-gold lion pendant/brooch necklace designed by Van Cleef & Arpels. It was one of Reagan's favorite pieces and she was photographed wearing it several times, most famously during her 1988 state visit to the U.K. The necklace, which can be broken down into four bracelets, was described as "iconic" and "so wearable" by Tom Burstein, senior vice president, jewelry department at Christie's, during an interview with CNN. The piece is estimated to sell for $30,000 to $50,000. The companion diamond-and-gold ear clips should fetch $15,000 to $20,000. 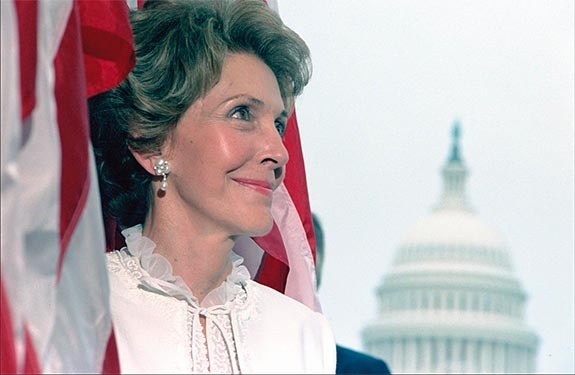 A close look at this beautiful portrait of Nancy Reagan with the U.S. Capitol in the background reveals her cultured pearl-and-diamond ear clips, the same items that will be offered for sale at Christie's. Reagan, who passed away in March at the age of 94, was photographed wearing these during a 1982 reception at the Capitol Mall marking the first-ever edition of USA Today. Christie's estimated the sale price to range from $1,000 to $1,500. The most patriotic piece in the group is a red, white and blue ring by Bulgari. 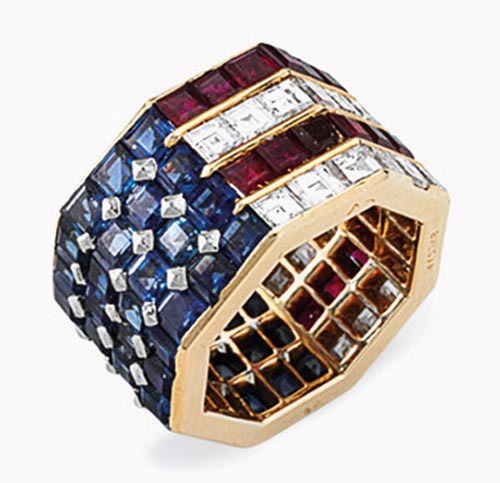 Featuring diamonds, sapphires and rubies, the octagonal-shaped ring has an American flag motif. The estimate selling price is $5,000 to $8,000. The First Lady appropriately wore this ring on July 4, 1986, at an event supporting the restoration of the Statue of Liberty. 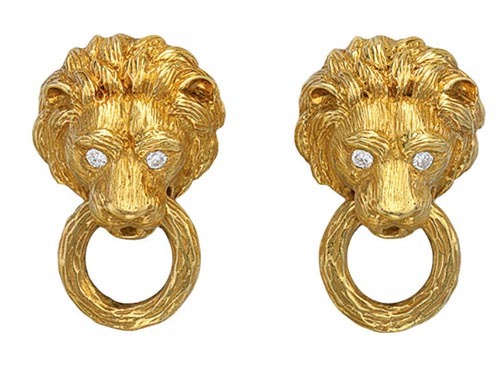 "It's a beautiful ring that is drawing the most attention so far," Burstein told CNN. "It will be the highlight." Among the most classically stylish items in Reagan's collection is a gold-and-diamond bangle bracelet, also by Bulgari. 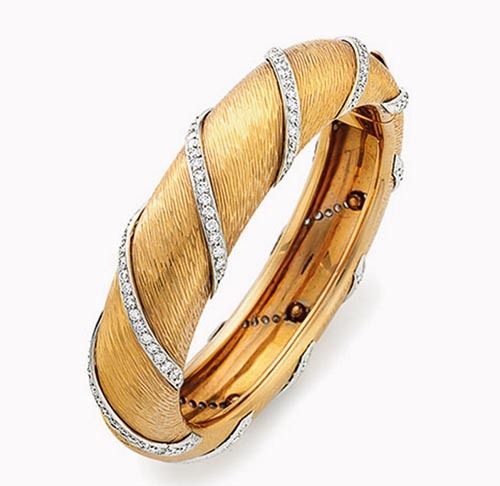 The textured 18-karat gold bracelet is intersected by diagonal platinum and circular-cut diamond rows. The First Lady wore this often at state dinners. The estimate selling price is being set at $5,000 to $7,000. In addition to fine jewelry, Christie's will be auctioning more than 600 items, including furniture, decorative works of art, books, memorabilia, paintings, drawings and prints from President and Mrs. Reagan’s home in Los Angeles. In total, the auction is expected to generate more than $2 million. Proceeds from the auction will benefit The Ronald Reagan Presidential Foundation and Institute. Credits: Jewelry images by Christie's. President Ronald Reagan and First Lady Nancy Reagan images via The Ronald Reagan Presidential Foundation. 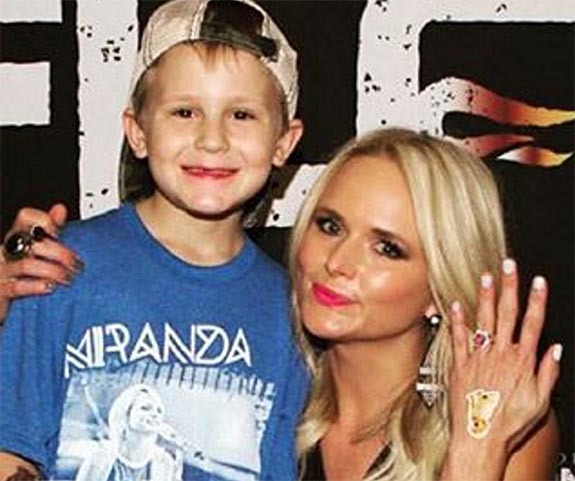 Country singer Miranda Lambert stunned the crowd at New Jersey's MetLife Stadium on Saturday when she interrupted her set to flash a pink ring and announce her engagement — to a six-year-old superfan. "I have to tell you something really important," she said. "I got engaged today." Instantly, the crowd erupted in applause. But then she added a few critical facts: "There's a little 6-year-old boy somewhere here named Sebastian. He asked me to marry him and I said, 'Yes, in 25 years.'" Then, she held the ring up near her face and said, "Isn't this beautiful?" "When he came to my meet and greet, he got down on one knee and he was such a gentleman," she continued. "It may be my favorite proposal ever… 'Cause, girls, we deserve that. We deserve that. So, that being said, thank you, Sebastian." The pint-sized Romeo reportedly bought the ring with his own money back in December and waited for Saturday's concert date to deliver his proposal. A stroke of good luck allowed Sebastian to attend a meet-and-greet before the show even though he didn't have the proper credentials to get in. Sarah Goddard, who did possess the required meet-and-greet sticker, was approached by the adorable suitor before the concert. Sebastian asked Goddard if she would propose to Lambert on his behalf. Goddard had a better plan. "I told his mom he could come in with me 'as my son' so he could propose to Miranda himself," Goddard told People. The 32-year-old Grammy winner, who split with Blake Shelton in 2015 and has been dating Anderson East since December, was absolutely floored by the character of the young man. The next day, Lambert reported the big news to her 2.8 million followers on Instagram and included a collage of two photos accompanied by this caption: "I said YES! But he has to wait 25 years. This sweet boy Sebastian is a little gentleman. 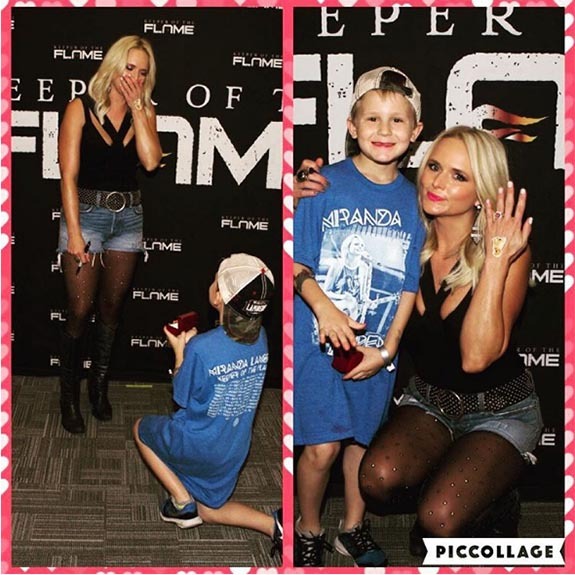 #pinkring #proposal #mademyday #jersey #spreadthelovetour"
The post already has generated 176,000 likes and 1,915 comments, such as this one from @mamassoul: "This is the sweetest EVER... You are an amazing woman @mirandalambert and I am sure little Sebastian had his heart FULL of every emotion possible!!! Way to go girl!!! 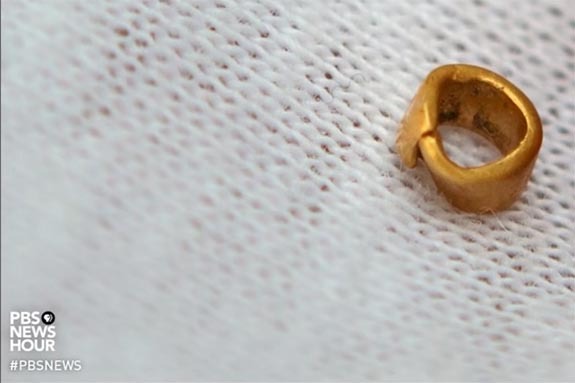 It's barely 4mm in width and weighs a scant .005 ounces, but this gold bead from a prehistoric settlement in southern Bulgaria may be the world's oldest gold artifact. 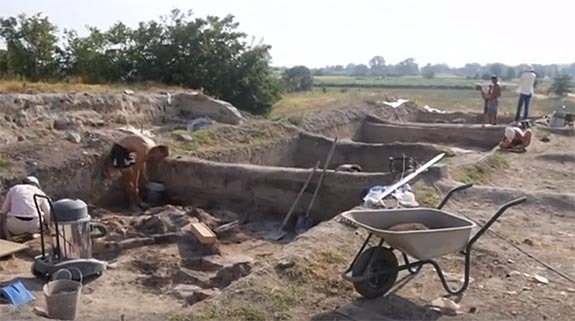 Archaeologists made the discovery at a site just outside the modern town of Pazardzhik. They dated the gold bead to some time between 4,500 to 4,600 BC, making it about 200 years older than the gold artifacts found in Bulgaria's Black Sea city of Varna back in 1972. The gold found at the Varna Necropolis was previously believed to be the oldest evidence of gold metallurgy. 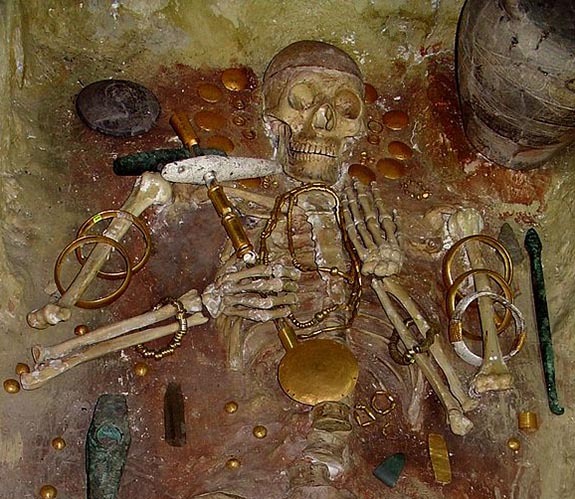 The burial site at Varna is considered one of the key archaeological sites in world prehistory and included a total of 294 graves containing 3,000 gold artifacts. Despite that massive discovery, the archaeologists at Pazardzhik believe their tiny bead is historic. "I have no doubt that it is older than the Varna gold," Yavor Boyadzhiev, associate professor at the Bulgarian Academy of Science, told Reuters. "It's a really important discovery. It is a tiny piece of gold but big enough to find its place in history." The tiny gold bead looks a lot like the tube-shaped, short-cut pasta preschoolers might use to string a Mother's Day necklace. The bead was found in the remains of a small house. Among the other artifacts found at the site were 150 ceramic birds, an indication that they may have been worshipped by the locals. 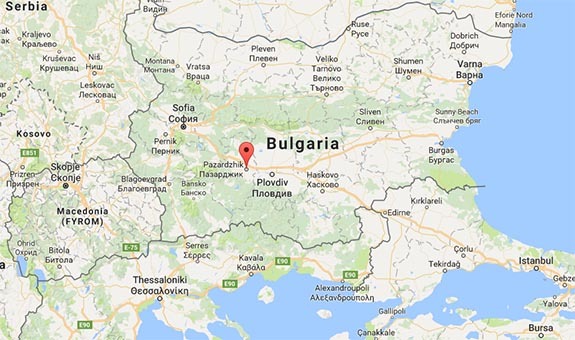 Boyadzhiev told Reuters that he believes the bead was fabricated at the site, which was the first "urban" settlement in Europe. He said the townspeople were highly cultured and had migrated there from Anatolia (in today's Turkey) around 6,000 BC. The settlement covered 25 to 30 acres and was protected by a nine-foot-tall fortress wall. The professor noted that there is evidence that the settlement was destroyed in 4,100 BC by a rival tribe that invaded from the north. Once the bead is thoroughly studied, it will be handed over to the historical museum in Pazardzhik for public exhibition. Credits: Screen captures via YouTube.com/PBS News Hour. Varna tomb image by Yelkrokoyade [GFDL, CC-BY-SA-3.0 or CC BY-SA 2.5-2.0-1.0], via Wikimedia Commons. Map by Google Maps.